Everybody knows that social media is a huge factor in how we communicate and socialize in the modern world. Research suggests that over 70% of all adults who are online have used social media, and astonishingly on August 24, 2015, it was claimed that one in seven people across the globe logged in to Facebook! In awe of these figures Coupofy decided to create an interactive infographic that could demonstrate the exponential growth that’s taking place on these social media platforms. While we can all appreciate that Facebook has somewhere in the realm of 16 million new users each month, when you see this number rise in real time it really begins to sink in. 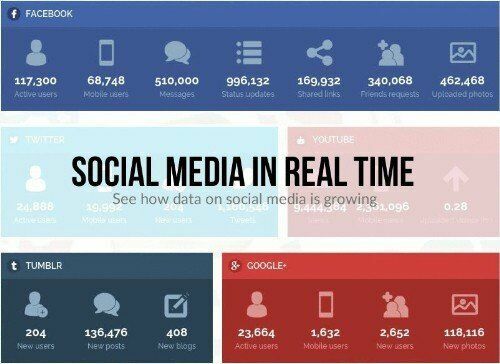 As soon as you open the Real Time Social media counter, a clock begins ticking and all the key growth indicators from the top 9 social media websites are shown as they increase every second. Sites monitored include Facebook, YouTube, Twitter, LinkedIn, Pinterest, Google Plus, Tumblr, Instagram, and Reddit. When last checked for just over 17 minutes, Facebook saw an increase of 5,851 New Users, 1,716 of those were on mobile devices, there were 2,630,000 new private messages, 5,136,916 status updates, 876,316 links shared, 1,753,684 friends requested, and 2,384,884 photos uploaded. In just over 94 minutes YouTube received nearly 263 million views, 65 million from mobile devices, and nearly 8 hours of video had been uploaded! The number of servers and computing power that must be needed to sustain these relatively short periods of activity is mind boggling. Of course in the world of social media it is celebrities that generate the most activity. Adele’s new single “Hello” was the fastest video to reach 100 million views in 2015. According to the counter in less than 100 minutes it managed to generate over 1.37 million views. Most YouTubers won’t achieve that amount of views in the lifetime of their channel. Likewise pop queen Katy Perry is able to generate thousands of new Twitter followers every single day, while soccer legend Cristiano Ronaldo is not too far behind with his daily increase in Facebook fans. Whether you want to record the number of new posts on Tumblr in the time it takes to make a sandwich, or you’re curious about how much data is generated by Pinterest every second, the Real Time Social Media Counter is a fascinating little tool.